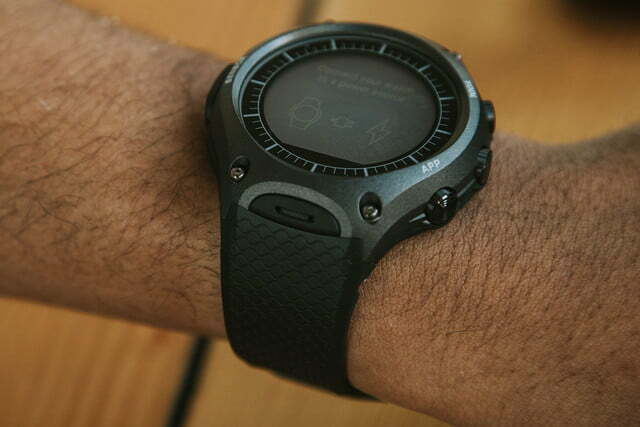 Android Wear and outdoor sensors make awkward bedfellows in Casio’s WSD-F10. 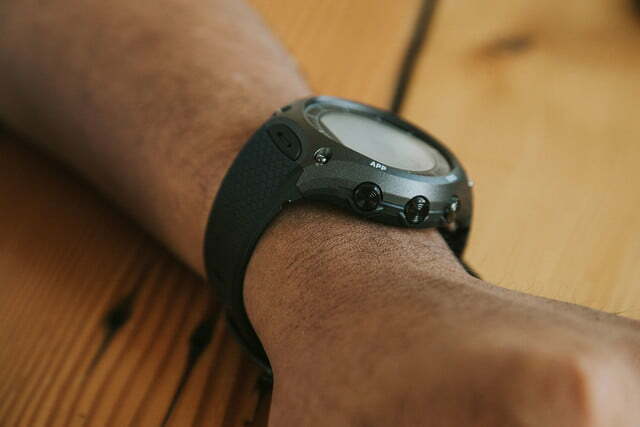 At a first glance, the Casio WSD-F10 looks like the classic rugged G-Shock watches for which the company is famous. 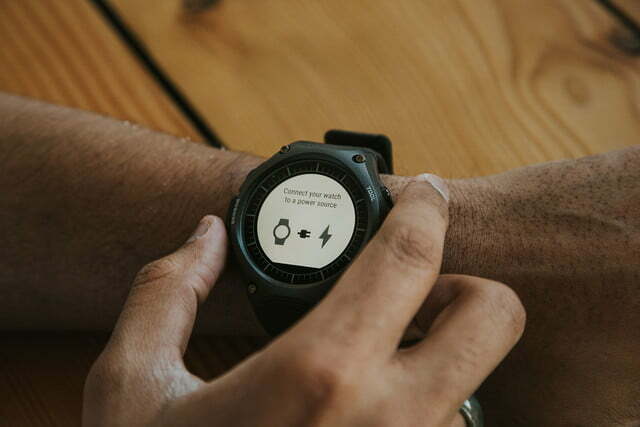 But once you see a notification pop up on the watch face, you’ll discover that this behemoth of a watch is something completely different — an Android Wear smartwatch. The WSD-F10 blends retro and modern into a niche product aimed at hikers, bikers, and fishermen. It has a distinctive design and robust outdoor features that bring much-needed practicality to Google’s smartwatch operating system. The watch stands out from other Android Wear devices, but at $500, it also costs significantly more than them. Is it worth spending double the money, or are you better off with a true outdoor watch? 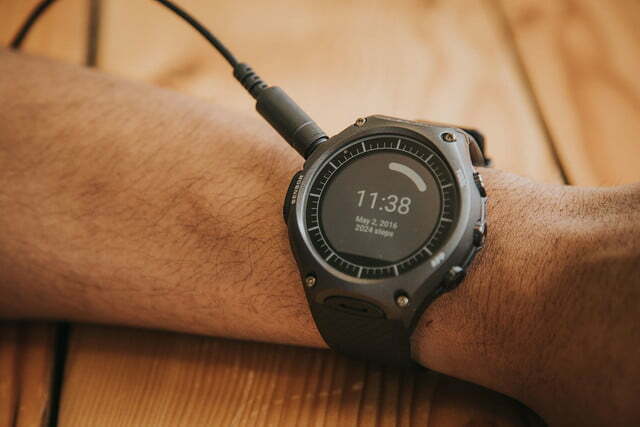 Unlike the classy Moto 360 and the sleek Huawei Watch, this rugged beast is ready to take on the outdoors: It’s big, bulky, and a little boring in terms of design, though the orange variant looks nice. The watch’s case is tough with a stainless steel back, and urethane resin band with its rubber and silicone texture. Unless you’re a lumberjack, this watch may not go with your look. 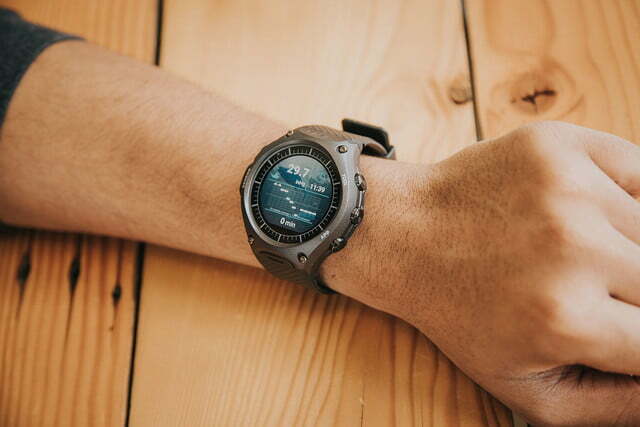 MIL-STD-810G certification means the watch has passed U.S. military standards for environmental protection, allowing it to take a dip in the water up to 50 meters. Its most unique feature is a “dual-layer display structure,” which means you can switch between using the color LCD and a monochrome LCD to save battery. The screen’s 320 x 300 pixel resolution is on par with the first Moto 360’s screen, but like that early smartwatch, it’s not fully circular. A clipped edge of the circle for display drivers forms a “flat tire” shape. You get used to it after a while, especially if you use dark watch faces, but competitors like the Huawei Watch don’t have that annoying deformity. You can eliminate women from the list of would-be buyers, because this watch is absolutely massive — and I say this as a man with large hands. After a while, I forget I’m wearing most watches, but a brick this massive strapped to your wrist reminds you it’s there with every movement. Despite its size, the WSD-F10 is much lighter than it looks. 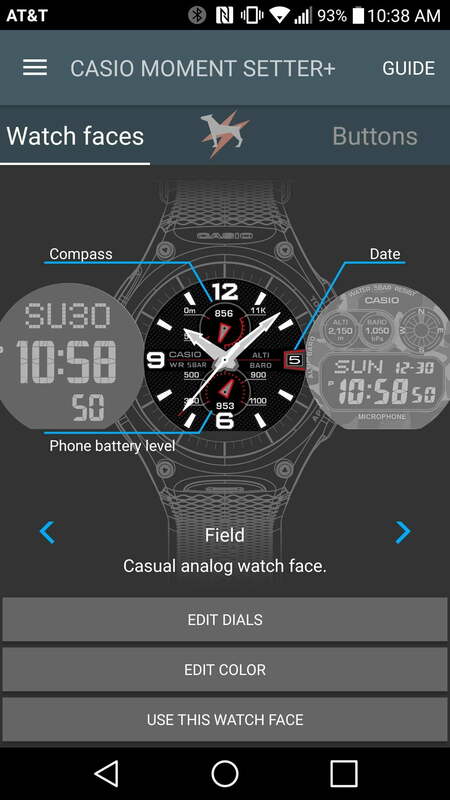 Casio’s CSD-F10 has three buttons on its right side: an app button, function button, and a tool button. The app button serves a much-needed role for Android Wear by acting as a shortcut to an app of your choosing. The function button powers the display on and off, but it also acts as a back button to the main watch face. 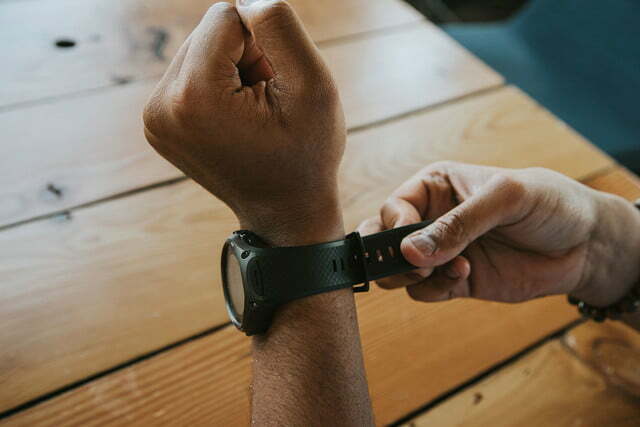 The tool button activates Casio-specific features that have been added to Android Wear, which are this Casio’s stand-out features. A clipped edge of the circle for display drivers forms a “flat tire” shape. For instance, a simple monochrome compass displays the direction you’re facing, or you can switch to the color LCD for a more aesthetically pleasing version with a bearing memory screen, which locks the direction you want to head in with a blue line. It helped me figure out which direction I had to head when I got out of the subway in New York City — and with the dedicated tool button, the answer was just one button tap away. An altitude tool can display your current elevation or a handy altitude graph that shows the highest and lowest you’ve been in the past 24 hours. Sadly, I didn’t get a chance to test it on any summits, but I was able to see how far up the Digital Trends office is above sea level! A barometer measures atmospheric pressure in inches of mercury (inHg), along with the highs and lows, which can help you predict the weather. But you’ll need to memorize the meaning of some readings. For example, if the graph shows a reading of 30inHg or below, it will likely rain in about 18 hours and continue for a day or two. A handy circular activity graph color-codes the times when you perform certain activities during the day, such as driving a car, running, walking, and just resting. In the center, you can choose to display the number of steps you’ve taken, calories burned, and more. Of all the tools, this was by far the most useful day to day. While Casio offers a legend to decode the colors, it took a while to memorize it for quick glances. A sunrise and sunset feature alerts you an hour before sun up or sun down, and a tide graph for fishermen and boaters will tell you what the water level will be at certain times, as well. 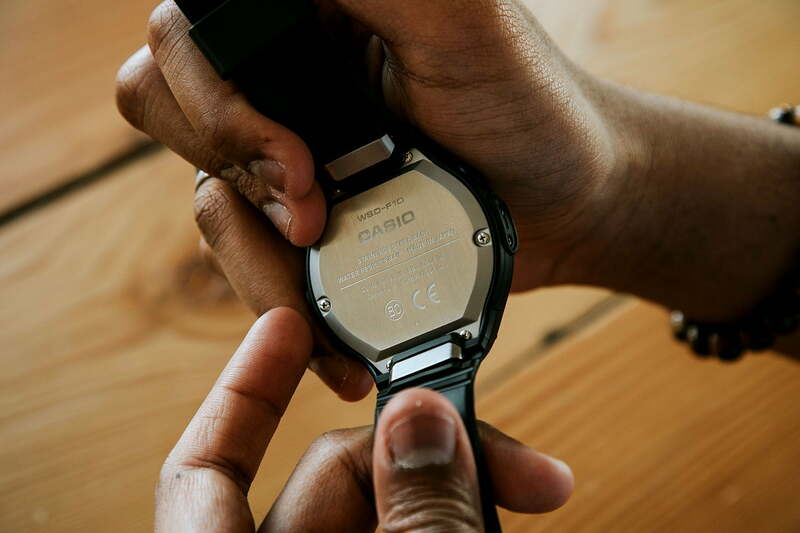 Rather than relying on a plethora of dedicated gadgets that give you these readings separately, Casio’s watch allows you to take it all in at a glance in one place, on your wrist. When you’re outdoors without signal, phone apps are useless, yet these sensors will continue to work. I never encountered any problems — except when it would ask me to twist my wrist in every direction for a few seconds to calibrate the compass. Casio’s watch gets the same version of Android Wear as every other smartwatch, but an OS meant to bring every single notification to your wrist, puts it at odds with the purpose of an outdoor watch. 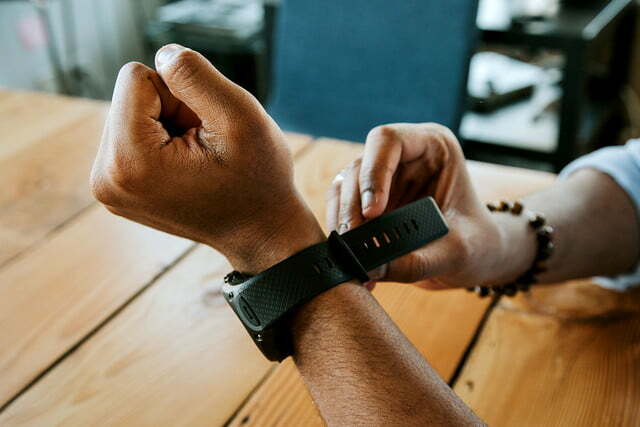 Sure, notifications are handy, but do you want to be receiving work email on your wrist when you’re outdoors, trying to get away from the hustle and bustle of everyday life? 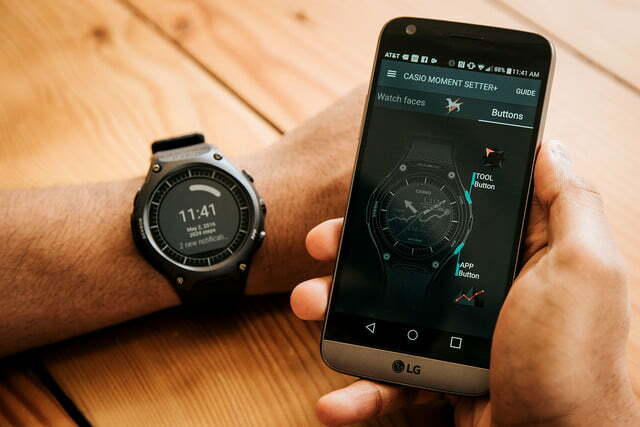 The Android Wear and outdoors features feel like two different software experiences on the same watch. Regardless, the Casio watch runs smoother than any other Android Wear watch I’ve used, and I never had any connectivity issues. The bigger problem is the interface: Casio doesn’t blend its features into Google’s OS. 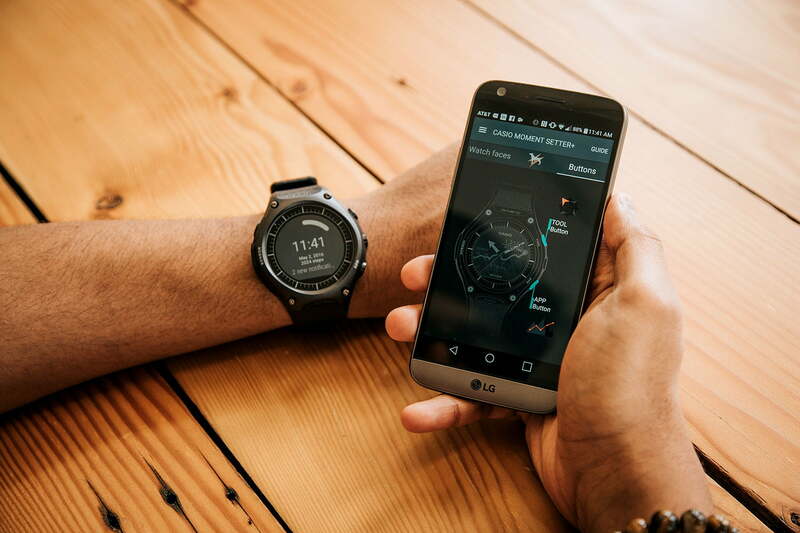 The Android Wear and outdoors features feel like two different software experiences on the same watch because Casio’s tools don’t follow the same design language as Android Wear. All of the outdoors features use text and numbers that look similar to what you’d find on a digital watch, with accents of orange, blue, and grey mixed on top of a dark background. It looks good, and it matches the design of the watch far more than Android Wear does. You just have to swipe up to go through the tools, and the transitions and animations are smooth. Oddly enough, the Casio WSD-F10 doesn’t come with a GPS sensor. 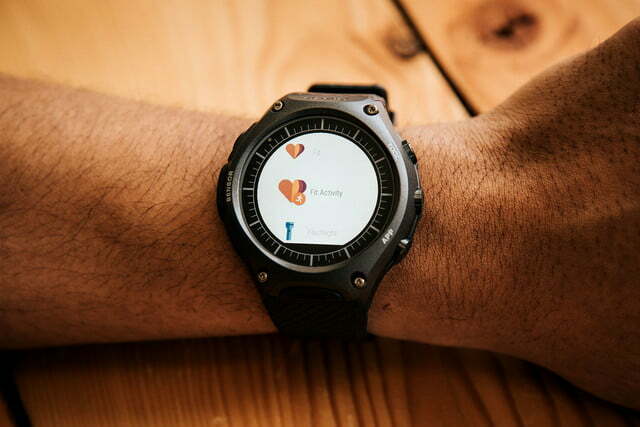 The addition of GPS would have catapulted this smartwatch to the top of the list. 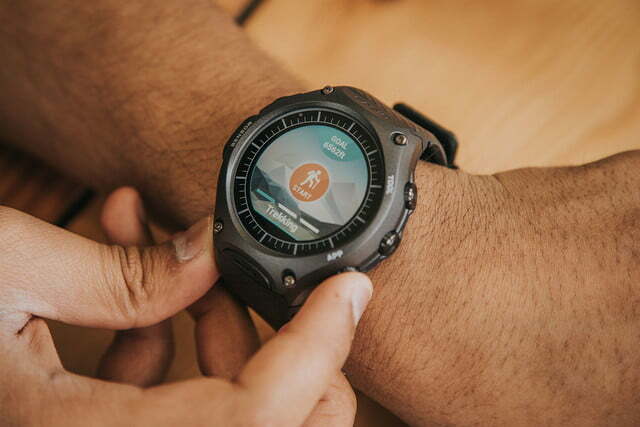 Thanks to Android Wear, you’ll be able to connect to your smartphone’s GPS to figure out your location, but when almost every other outdoor sensor imaginable is available on this watch, it’s puzzling to see that GPS is missing. Not all of Casio’s designs are wins, though. 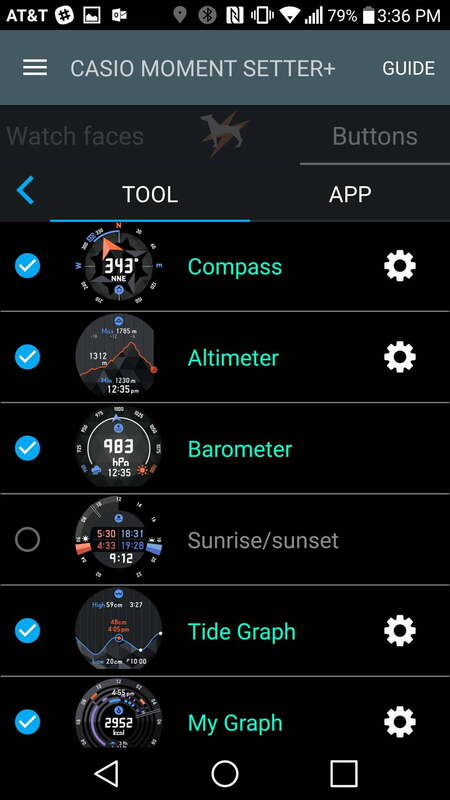 Moment Setter+, the app you can use set different watch faces, is riddled with bugs, and looks like something out of the early smartphone app days. Thankfully, you don’t have to use it much, and Casio’s watch face designs match the watch’s aesthetic better than the ones you’ll find on the Google Play Store. Some even use of the sub dials to provide more information, like barometric data. You can also make several of the tools and activities more relevant to your location and time. 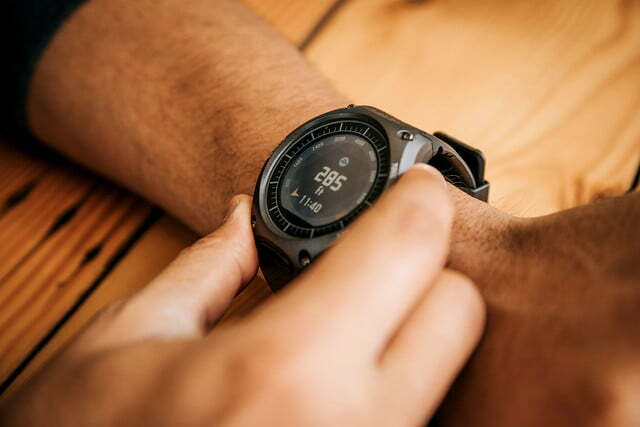 For example, when hiking, you can opt to display the remaining altitude when you’re 200m away from the “target altitude of 2,000m.” You can also ask the watch to display the sunrise time; or if you are about to fish, you can ask to notify you of the expected fishing time an hour before. These contextual reminders made me use the WSD-F10 more. 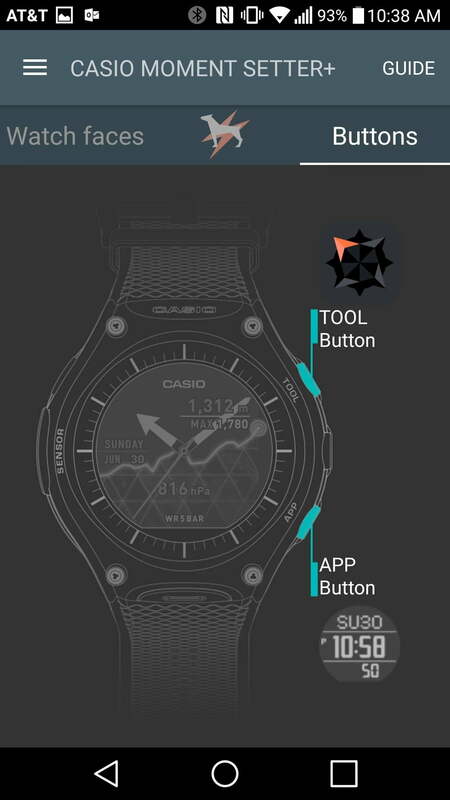 With most smartwatches, I tend to forget the apps and features that are available, but Casio’s app actively prevents that with relevant alerts. You’ll also find many popular outdoors apps pre-loaded on the watch, including MyRadar, RunKeeper, Yamap, and ViewRanger. While Yamap, a social trekking app, is useless outside of Japan, ones like ViewRanger detail far more information on your treks, such as route information, the distance to the next waypoint, and more. 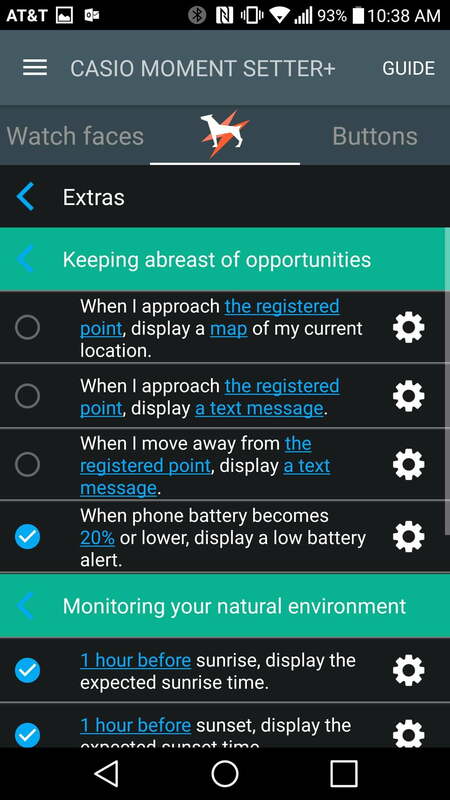 Besides merely displaying data, the WSD-F10 has activity modes that can help you make use of it. The magnet is so weak that it hardly stays on the watch when charging. When you turn these activities on, it triggers relevant sensors to capture data based on the experience. So for fishing, the watch will begin recording the atmospheric pressure, while displaying a graph of readings from the last two hours. The atmospheric pressure tool and the tide graph can be combined to tell you the best time to cast off. Cycling mode shows you the time, the distance covered, and your traveling speed, while the trekking mode just shows the elapsed time, your remaining altitude from your goal, and pace. The only downside to the modes is that the watch will only display a fixed set of information, and you can’t customize it. The data is also tightly packed into one screen, so it can be a hassle trying to get an understanding of what’s going on at a quick glance. The option to have these event specific features is nice, though, and they can undoubtedly still come in handy. 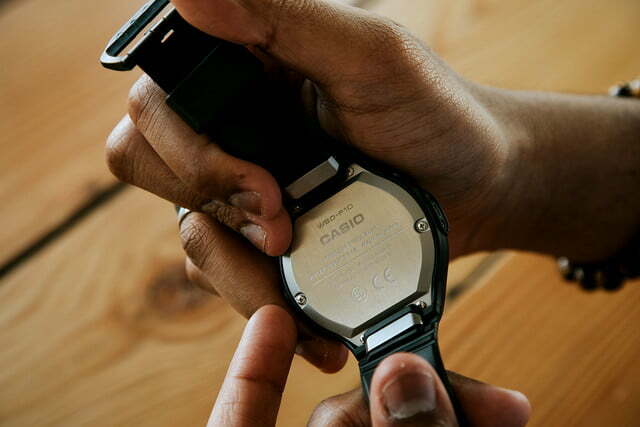 Casio’s dual-layer LCD lets you keep information accessible without burning precious battery. When you’re in any tool, just tap and hold the tool button for 3 seconds to switch to a monochrome, minimalistic display. You can also have the watch switch to monochrome when no operation is in progress, similar to Android Wear’s ambient mode, which darkens the display and just presents the time. If you’re really want to stretch the battery, you can even indefinitely turn Android Wear off and switch to a basic digital watch. But in Timepiece mode, your watch will only show the time and date — you can’t even use any of Casio’s neat tools. With moderate use, the watch typically lasted a day and a half. I would often come home from work on the second day with about 15 percent left. 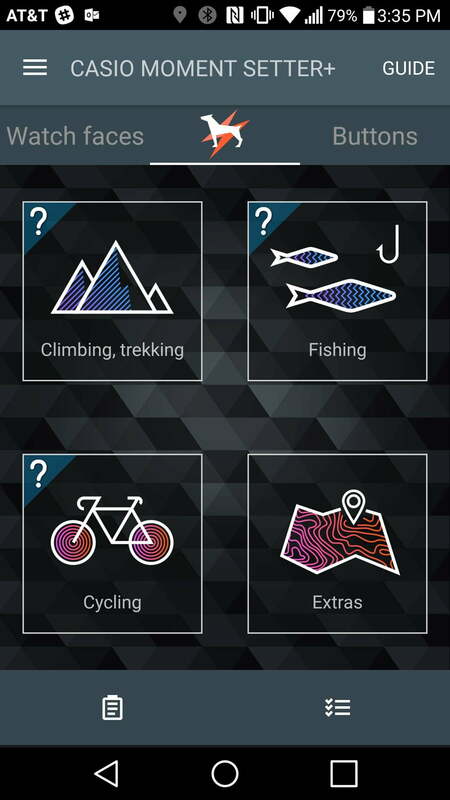 Triggering tasks like trekking and fishing cuts down on that time even more, pulling it under a day. But if you want an outdoors watch, you’re probably going where you won’t be able to find an outlet every day. Frankly, given the watch’s size, one-day battery life is unacceptable. Casio should have fit a larger battery in there. When Android Wear says the battery is at 0 percent and turns off, the device automatically switches to the monochrome display with just the time, until it finally dies, too. It would usually stay alive for an extra day or so. 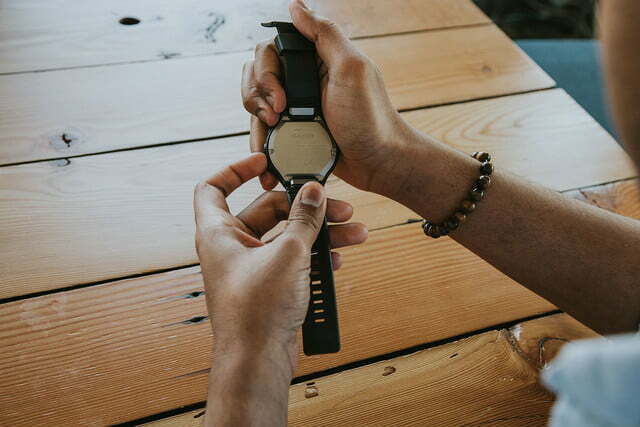 The magnetic charging cable for the watch is also abysmally short, and it’s proprietary, so you can’t share it with other devices. What’s even more frustrating is that the magnet is so weak that it hardly stays on the watch when charging. A simple tug, and it falls off — It’s the worst part of this watch. The WSD-F10 has a one-year limited warranty, but the device is only available in the U.S. and Japan. You may have trouble getting some of the features to work if you import it to your country, as they may be region-locked. 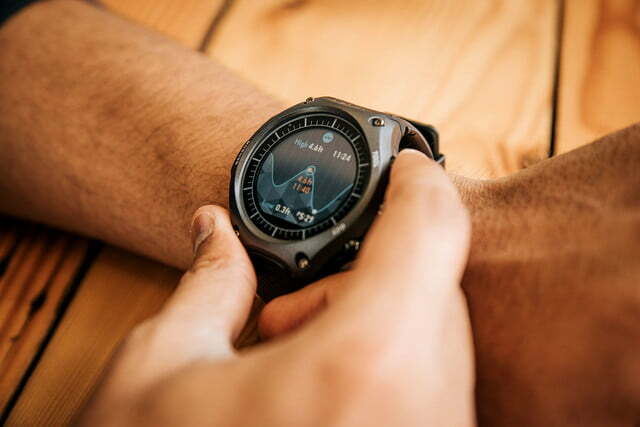 Many smartwatches offer Android Wear, and many outdoor watches offer the Casio’s sensors, but none besides the WSD-F10 offer them both in one watch. If you’re an Android Wear enthusiast who’s used to wearing large, rugged behemoths of watches, then this watch is certainly for you. But for $500, it’s significantly more than most competitors. If you won’t frequently use the outdoor sensors, this watch is definitely not worth your money. Outdoor enthusiasts won’t be fazed by that price, because rugged outdoors watches typically run more than $500. At that point, the question is whether you really want to bring Android Wear outdoors. Keep in mind that most of Android Wear’s notifications don’t work without cell service, and you might not want them interrupting your hike, even if they do. 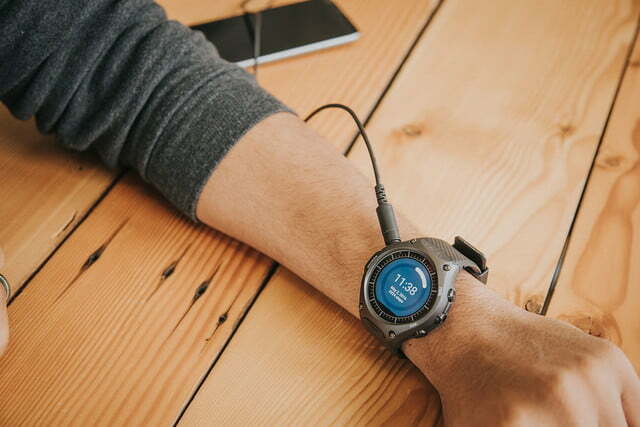 Garmin’s Fenix 3, comes with a GPS and an array of other sensors for the same price of $500, offering more bang for your buck. Sadly, Casio’s WSD-F10 is just too pricey for what it does. You can enjoy better outdoor watches for the same price, and those won’t die on you before you reach the summit.